A new report from Axe reveals the preferred aroma of local ladies. 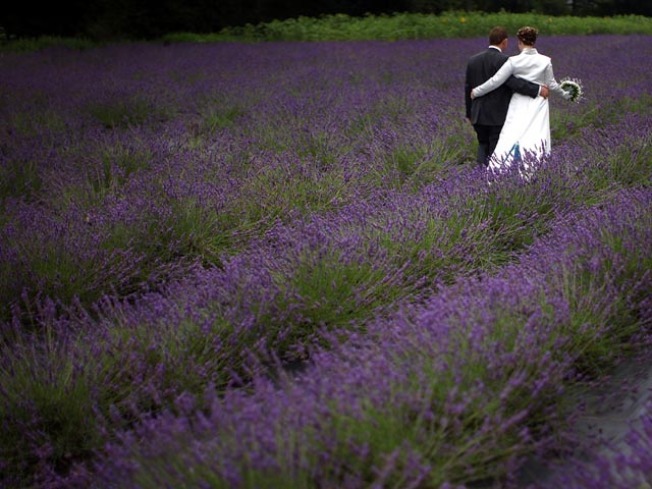 This happy couple takes a stroll through a field of lavender. Nowadays, the modern man can customize his personal aroma thanks to thousands of colognes, body sprays, shower gels, deodorants, lotions and oils. The male odor business has expanded so greatly, companies had to hire scientists to invent new smells. One company actually makes an "arctic edge" deodorant. Where in nature did that smell come from? Is that what icebergs really smell like? With all these choices out there, the modern man could use some guidance. Enter a new study from Axe. The body spray maker commissioned a survey of thousands of women across 10 major U.S. cities. The goal was simple -- to unearth what scents turn girls on. For the women of Los Angeles, the most seductive aroma was lavender. Drive a little south to San Diego, and the preferred smell is suntan lotion. They didn't test Anaheim -- but if we had to guess -- we recommend OC bachelors hedge their bets with some lavender suntan lotion. "Guys should heed these findings as research has shown that when women are in the presence of a preferred scent, they are more likely to project positive feelings on those around them, which can lead to increased attraction," said the study's author, Dr. Alan Hirsch, director of the Smell & Taste Treatment and Research Foundation.